At long last, we have come not only to the end of a chapter, but the whole book of Proverbs. The last verse of the last chapter is both a statement of praise for the virtuous woman and a challenge for us. Wisdom will receive the fruit of her labor. Her works will praise her in the gates. But what of us? What of our works? The virtuous woman of this chapter has done everything with wisdom and grace; she deserves what is coming to her. The product of her faithfulness, her ingenuity, her holiness, and her benevolence will speak of her in the highest places of honor. Her works are her testimony; she need not speak of herself. But what will be said of us? When it all comes down to where the rubber meets the road, we will reap what we sow. If the nearly two years it took to write the “thoughts” found here on this site (or the book which hopefully will follow) were worth anything, there will be fruit, and Wisdom will be praised in the gates. It is hard to believe that almost two years have gone by. 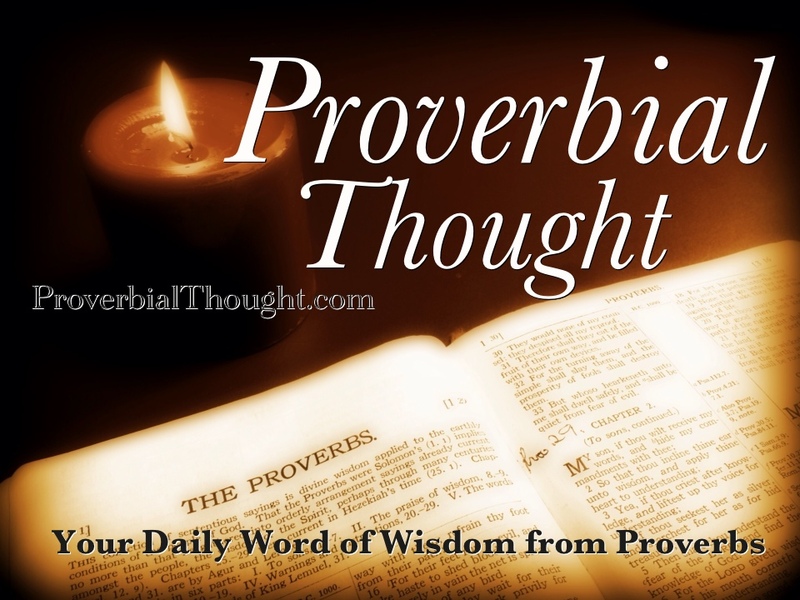 Since the first post on Proverbial Thought was written back on April 1, 2012, much has happened; much has been endured; much has been learned; many have been blessed; and many have become wiser. But the real blessings yet to be had are the ones that will be revealed in eternity: the marriages that stayed together; the poor choices not made; the hearts made more in tune with God’s Spirit; the lives saved by simple moments of vulnerability; the eyes turned to Christ, the Wisdom of God. Thank you dear friends and subscribers, especially all the contributors, for a wonderful and enlightening journey through this ancient book of wisdom – God’s Wisdom. I pray it was fruitful. This entry was posted on Thursday, February 20th, 2014 at 4:00 am	and tagged with Proverbial Thought, proverbs, Proverbs 31 and posted in Faithfulness, Value and Worth, Wisdom. You can follow any responses to this entry through the RSS 2.0 feed. “For as the rain comes down, and the snow from heaven, And do not return there, But water the earth, And make it bring forth and bud, That it may give seed to the sower And bread to the eater, So shall MY WORD be that goes forth from My mouth; It shall not return to Me void, But it SHALL accomplish what I please, And it SHALL prosper in the thing for which I sent it.” (55:10-11). Amen! Verily, verily, it has been great! While some times have been tough to keep at it, and at other times we made technical oopsies (that is a technical word, too! ), and at still other times we were challenged ourselves, this has proven beneficial for each of us as well as for others. It has been a fun ride, and I look forward to what God has in store for Proverbial Thought and each of us! Yesterday ended the trek through Proverbs for several of us friendly bloggers, 9 total, including a girl … no … young woman! Farewell, original endeavor! Welcome new opportunities and blessings!